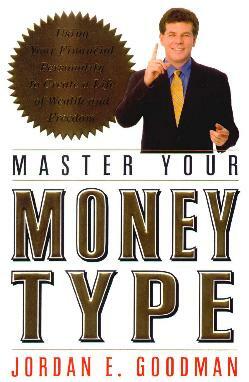 "Using your financial personality to create a life of wealth and freedom", it says on the cover. Sounds like a good idea. Author Jordan Goodman, financial commentator on radio and TV, lecturer, author, and Wall Street correspondent for "Money Magazine", has advised thousands of people who fell behind with their credit payments, overspent, and were near the end of their tether. He offered tailor-made advice for each particular case, once he'd established their particular "financial personality" - this was once he'd found the common thread - "Everyone's money behavior falls into definable patterns", he says. Importantly, Goodman points out that "You and your money are going to have a lifelong relationship, and to make any relationship flourish, you need to know your strengths, weaknesses, undeveloped talents, and also which traits are so fundamental to your core personality that you'll need to make peace with them". The essence of this book. You can identify your dominant money type by recognizing which one is closest to you (you'll probably take some characteristics from other types) from the list of six: The Strivers, The Ostriches, The Debt Desperadoes, The Coasters, The High Rollers, and The Squirrels. He presents real-life cases of people's financial quandries and gives details on how they overcame them. Visit Goodman's website for more information. Conclusion - Useful to help us get in touch with our finances.